We will break down many of the top 2015 division one junior college recruiting classes over the next several weeks. Some D1 programs rely heavily on JUCO transfers, while others may only pick up one every few years. Today we will take a look at Baylor’s JC recruiting class, which features one of the top junior college players in the country in the 2015 class. Joseph Acuil is currently ranked as the #4 player in our www.JucoRecruiting.com 2015 Top 100 Player Rankings. Our final 2015 rankings will be released in late June. Baylor has had plenty of success with JUCO transfers in recent years. They have had Pierre Jackson (CSI), Kenny Chery (State Fair), Deng Deng (Lee College), Lester Medford (Indian Hills), etc. This year Baylor has added some size in seven-footer Joseph Acuil, a transfer from Neosho CC. What is Baylor getting in Acuil? 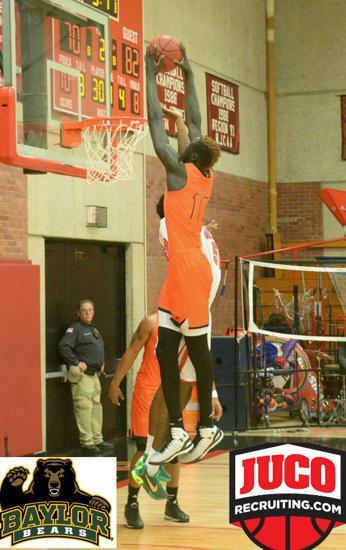 They are getting a 7 footer who has the potential to cause serious matchup problems for opposing defenders. Acuil is extremely long and mobile for his size and has a smooth stroke from 15-17 feet. He also has the ability to knock down open threes. Acuil shot 30% (12-41) from the three-point line as a JC sophomore and this looks to be a part of his game that he could continue to develop over the summer. Acuil averaged 20 points and 11 rebounds per game during the 2014-15 season at Neosho and was also third in the country in total blocks. He shoots the ball at an extremely high percentage (61%) and is solid from the free throw line as well (72%). Acuil, who was very thin last summer and early in the season, has added some size and will need to continue to do so this summer to handle the day-to-day battles in the low-post in the Big 12. His unique skill set will create matchup problems regardless and he should be able to impact the game immediately on the defensive end. He has great timing when blocking shots and has the ability to keep the ball in play after a block. Acuil has very good hands for his size and can get out in transition and catch/finish on the move. His length and athleticism along with his size make him very tough to defend. The Baylor staff has done a good job again this year in locating and locking in one of the top JUCO players in the country.